We’ve all heard the stories! Someone has too much to drink at a bar, gets in their car to drive home, and has an accident. However, there’s another aspect to this that only bartenders and wait staff have to think about: their personal liability in this situation. We’re often told that the victim of a drunk driving accident can sue the bar. This happens when the perpetrator was allowed to get intoxicated to the point of being dangerous. But, there’s often some confusion as to whether or not this is actually the case. We’d like to clear that up. Read on for some useful info about your personal responsibilities as a bartender and how to protect yourself and your customers. Dram Shop laws, and SIP laws (sales to intoxicated persons), are the set of rules that govern how an establishment can be held accountable for injuries incurred due to a patron’s drunkenness. In general, it works like this. 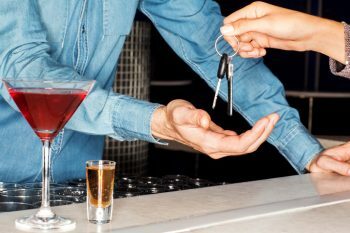 If a person becomes intoxicated at a bar and then causes some sort of injury to another person, both the establishment and the perpetrator can be held accountable. These laws vary state by state, but almost every state has one. In some places they extend to social gatherings as well. This means if you host a party and over-serve someone, you could be liable for any damage they cause. This is especially true if you are serving alcohol to minors. Who in some states can sue you if they themselves sustain an injury. So, if you have a get together at your house and someone causes an accident or hurts another person on the way home, you could be held accountable. What Does This Mean for You as a Bartender? Under Dram Shop laws, it is the establishment that can be held responsible for injuries caused by an inebriated person. However, while it may be the bar that pays the fine, there’s nothing protecting you from action your bosses may take against you. It does not seem fair that any part of someone else’s decisions and behaviors can fall on you or where you work. But it is the unfortunate reality of the service industry. The legal parameters that define drunkenness outside of just strict blood alcohol concentration differ wildly state by state. It can sometimes be vague and very subjective. However, they are important to know. Because they are the deciding factors of whether a bar can be held liable for a patron’s actions or not. Generally speaking, you shouldn’t be serving someone who is “visibly intoxicated”, known to be an alcoholic, or a minor. Protect yourself and your establishment by knowing the signs of drunkenness such as slurred speech, stumbling, bloodshot eyes, etc. If you encounter these things, don’t risk serving the person. Grab a manager if you feel uncomfortable or nervous about cutting someone off. It’s also a great idea to talk to your boss about enrolling the staff in a certification class like TIPS. These classes teach servers and bartenders how to keep themselves and their customers safe. They can also be a defense against liability should an issue arise. Disclaimer: We are not lawyers so please consult one if you have any questions about serving, liability, injury, or anything else.